Indeeco offers a wide variety of designs for heating gases, liquids and soft metals by direct immersion. Standard units in copper, steel, stainless and Incoloy; custom units in many different sheath, screw plug and flange materials depending on application requirements. Optional liquidproof or explosion-resistant terminal boxes, hermetic terminal end seals, high temperature construction and built-in controls. UL Listed, UL Recognized, CSA Approved, and CE Certified designs are available. Since Indeeco specializes in custom-designed heating equipment, we stand ready to review your applications that are out of the ordinary. 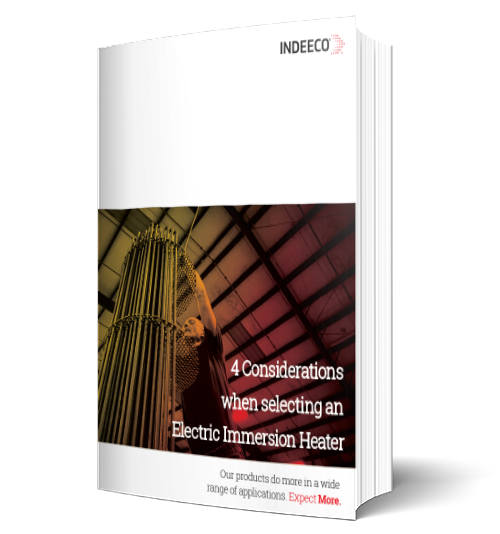 Indeeco flanged immersion heaters are one of the most widely used solutions for heating fluids and gases. Designed for use in tanks, pressure vessels, and in-line heating, flange heaters are easy to install and maintain. Screw plug immersion heaters are ideal for use in direct heating of liquids and gases in a variety of processes for hazardous and non-hazardous locations. Indeeco offers customized wattages with voltages up to 600V and are available in 1", 1-1/4", 2", 2-1/2", and 3" NPT sizes. Indeeco Tank Heaters are used to maintain or raise the temperature of gases and fluids in tanks from -300°F to 1000°F for a variety of applications and industries. These heaters are designed with low watt density, open coil heating elements for uniform heating of even the most temperature sensitive materials. Large Diameter Elements provide extra electrical insulation for superior dielectric strength. Element insulation is compacted to insure uniform heat transfer from coil to sheath and all bends are repressed to insure insulation integrity in this critical area. Special sheath materials and alternate flange designs are available for special needs. Bottom-Mounted immersion heaters were originally designed for use in coffee urns. However, their compact construction makes them ideal for use in steam tables, humidifiers, sterilizers and other applications requiring a very low heater profile and a short element length. These 4-7/8” flange heaters are three-element modules specifically designed for large steam or hot water boilers. They offer a simple, practical solution to two problems inherent in all electric boiler designs: element stocking and field replacement.